Listen to an excerpt from Ferris Wheels and Other Childish Nonsense. Written by Joe Sorbara. As a composer, interpreter, improviser, listener, and educator, Joe Sorbara’s main musical interests lie in the exploration of the ‘in-between,’ that is, in the vast area that lies between the worlds of music that are ‘freely improvised/ spontaneously composed’ and music that is ‘pre-­composed’. Specifically, he is interested in using his compositions to explore the spectra of degrees, qualities, and types of freedom and constraint existent in this space—a guiding interest that has led to the creation of Ferris Wheels and Other Childish Nonsense (2008), a piece originally composed as a way to support the learning and ­music-making potentials of the Contemporary Music Ensemble at the University of Guelph. While Sorbara has been incorporating graphic symbols and notation throughout his compositions for years, this piece represents his first foray into representing his work completely in graphic notation and as a full graphic score. 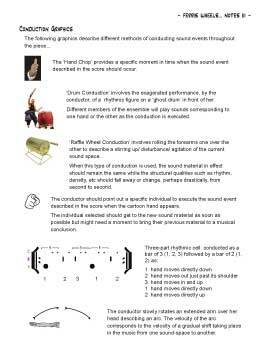 Created and structured to aid musicians in playing his work, graphic notation here provides alternative explanations and details about particular sonic techniques and gestures. Through his practice, he strives to create opportunities for individuals of any background or musical training to find connection to his work, and to allow each performer the opportunity to respond in individualized, creative, and novel ways. 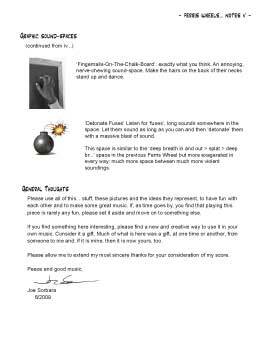 Sorbara views his scores as obstacle courses (more complex, perhaps, than linear ‘road maps’), providing opportunities for the musicians to negotiate and navigate their way through visual instructions, while being challenged and having fun. As such, he uses notation that describes what he wishes to happen musically throughout the piece in ways that traditional notation or written words cannot capture as simply. Ferris Wheels and Other Childish Nonsense is designed for nine or more musicians. The players are divided into three groups of equal size, with at least three individuals per group. The players within each of these groups are then divided up into another three groups: A, B, and C. As such, each of the numeric groups will contain at least one member of each of the alpha groups. There are parts for each of the numeric and alpha groups colour-coded within the score. 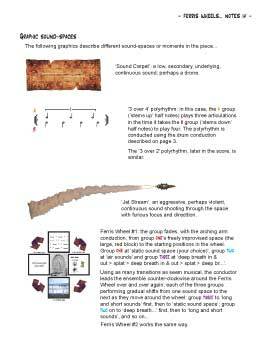 These groups are positioned in three separate areas in the performance space, with their initial entrances into the room staggered throughout the first four minutes of play. The performers follow a narrative described from left to right across the score, aided by a conductor who has a number of different cues to perform. These cues are marked in the score with approximate time codes. 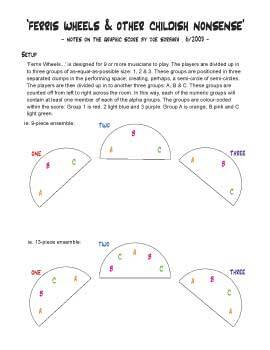 As they enter, each player begins repeating a simple melodic figure that is taken up by each of the subsequent ensemble members as they enter the performance space. One by one, and very gradually, the players make their way to the main playing area in the centre of the room and assemble into their groups. At the end of the piece, each player again gets up and moves around, eventually walking out of the performance space. 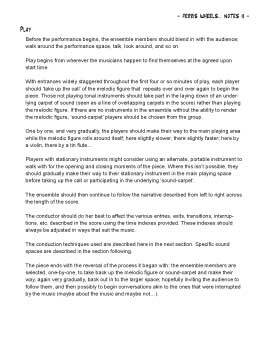 It was Sorbara’s intent that, with the staggered entrance and the movement throughout the playing space, the musicians would blend in with the audience, breaking down some of the conventions of traditional concert experiences and barriers between performers and audience members. As a composer and percussionist, Sorbara continually strives to find different ways of performing shifts from one sound space to another, while still providing opportunities to explore the myriad possibilities of ‘in-between’ spaces. Ferris Wheels and Other Childish Nonsense is Sorbara’s most recent attempt to move through soundscapes using different types of shifts, movements, and textures, in order to encourage the performers of the piece to experiment further with their own practices, and with the sonic potential of their instruments and of the space within which they are performing. Ferris Wheels and Other Childish Nonsense premiered on November 21st, 2008, performed by the Contemporary Music Ensemble in Guelph, Ontario. It has subsequently been performed on December 12th, 2008, at Somewhere There in Toronto as part of the Leftover Daylight series.